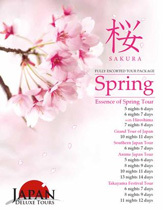 We will recommend Japan Deluxe Tours to our friends. She provided a daily schedule. She is so friendly and helpful. Her directions were clear and easy to follow. We saw so many places. Great itinerary!